Set directly on the banks of the Sand River in the shade of mature ebony trees, Londolozi Founders Camp has warmly welcomed adventurers from around the globe for more than 30 years. Intimate and enchanting, Founders Camp provides the perfect base for exploring the Sabi Sand Game Reserve, which is considered by many safari connoisseurs to offer the continent’s finest overall wildlife viewing experience. Set among ebony and matumi trees, Londolozi Founders Camp is the ideal blend of luxury and intimacy. This camp, with just seven chalets, is great for families with children over the age of four, or small groups. Outstanding naturalists reveal the incredible wildlife that Londolozi is known for. 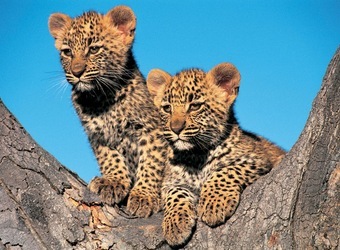 Keep your eyes open for one of the famous leopards! Steeped in the rich legacy of three decades of safari excellence, Founders Camp continues to charm guests with its unique blend of relaxed bohemian luxury and first-rate service. Set on the Sand River, seven air-conditioned chalets exude authentic safari style with dark woods, explorers’ chests and traditional colonial decor. The main area, built on a system of tiered decks extending over the river, provides a bird’s eye view into the bush. High thatched ceilings and a casual, open-air environment make this camp feel like a relaxed home away from home. Take a refreshing dip in the pool before enjoying sumptuous African-inspired cuisine and a bottle of wine from the excellent cellar, as you watch wildlife gather along the verdant fringe of the life-giving Sand River. Encompassing 40,000 acres of wilderness, Londolozi ensures that no two safari drives here are ever the same. As the original South African safari destination, Londolozi has over its more than eight-decade history perfected the art of hiring the very best rangers, trackers and naturalists. This diverse team of experts boasts a combined guiding experience of more than 350 years. Trackers sit at the front of the Land Rover scouting for fresh animal tracks, while rangers drive with astonishing skill through ravines and thickets in pursuit of elusive animals, all the while wowing guests with their outstanding knowledge and unforgettable stories. A highlight here is the world-famous ‘Leopards of Londolozi.’ Featured in countless documentaries, coffee-table books and magazine articles, this well-documented leopard dynasty has thrilled wildlife lovers from around the world. Fortunately, Londolozi’s rangers are all keen photographers and are adept at helping guests capture stunning images of these magnificent creatures. The name Londolozi is derived from a Zulu word meaning “protector of all living things,” and it is this ambitious conservation ethic that informs every aspect of life here. The reserve has been nurtured back into abundance through diligent efforts to restore river systems and natural drainage lines, and to restock and rebuild the natural productivity of the land. Since 2000, Londolozi has invested hundreds of thousands of dollars in habitat restoration projects, overseen by some of the world’s leading experts in rangeland ecology. These efforts include an innovative micro-catchment management program, which helps the land to retain its water and has made it nearly resistant to drought, as well as an aggressive invasive plant control strategy. A huge amount of time, money and effort have also been invested in bush-clearing programs, which have restored a mosaic of habitats, increasing the diversity of animals found in the area. "The camp was lovely all around, and wonderful food and service." When did you visit Londolozi Founders Camp?